Seijun Suzuki's Nikutai no mon / 肉体の門 / Gate of Flesh (1964): set in the post-World War II devastation of Tokyo, a dazzling look at how people struggled to survive. Part pulp, part Surrealism and part everything but the kitchen sink, Gate of Flesh has a fresh, crazy feel even now. Destruction is everywhere. Much of the population suffers from some variation of post-traumatic stress, shell shock and "nostalgia" -- psychic damage from firebombings and other forms of mass violence, both dealt out and received. The "returnees," as veterans from the various battlefronts were called, are warily received, while organized gangs (yakuza) run rampant, black markets flourish, and prostitution is pervasive and brutally competitive. American occupiers, including Military Police (MPs) roam through the urban tangle with weapons at the ready, half suppressing and half participating. It's a sort of massively scaled industrialized version of Deadwood. 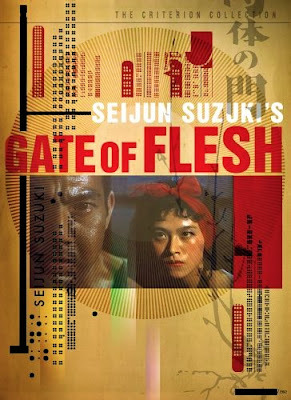 Gate of Flesh is based on a 1947 novel by Taijiro Tamura (1911-1983). What's striking about the Seijun Sazuki (1923-2017) adaptation is how much wilder it is than Japanese films made during the actual American occupation. Why? Because immediately after the war, American authorities censored everything in occupied Japan with a heavy hand, but by 1964, that was gone. The Criterion Collection DVD set has lots of extra goodies. It's also worth noting that there are five adaptations of the Tamura novel, three of them made after Sazuki's version.